GAIL Porter was graceful in her defeat after being beaten to the top of a London skyscraper by Calum Best and Nell McAndrew. 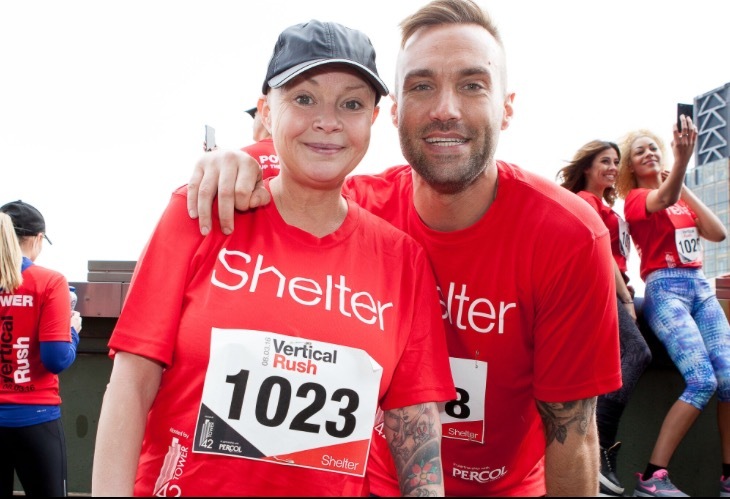 Gail joined Callum, Nell and other personalities including George Lineker, son of Gary, Martin Lewis OBE and Gogglebox's George Gilby in the adrenalin fuelled race to the top of London’s Tower 42 for housing and homelessness charity, Shelter. Despite her best efforts Gail came 11th out of the 13 contestants in just over twelve and a half minutes but was philosophical. She said of her defeat: “I would happily race up Tower 42 all over again, because I know from personal experience just how scary it feels to lose your home. Shelter is as important now as it was 50 years ago, providing a lifeline for millions of families struggling every day to keep a roof over their head. I feel blessed to have now come out the other side and be able to do something to help.”Now in its eighth year, Vertical Rush retains the record as the UK’s tallest and toughest tower-running challenge, with 932 steps and 42 floors to conquer. But, despite the daunting 600ft ascent, every celebrity runner was still feeling ultra-competitive when the starting whistle blew this morning. Over 1,000 members of the public, and a further 10 elite tower-running athletes competing professionally in the event. Shelter, which turns 50 this year, is hoping that Vertical Rush will raise more than £350,000 for the charity’s expert advice, support and legal services, and make a huge difference to thousands of families battling to keep a roof over their heads. Finishing in under 9 minutes, making him the fastest male celebrity to take part in Vertical Rush 2016, Calum Best said: “I can’t quite believe that I managed to get up there so quickly – it’s a lot tougher than you think. But it's definitely been worth the effort to support the amazing work that Shelter does. I think it's great when charities put on an event that challenges you, while also helping others. Thanks so much for inviting me to take part - I can't emphasise that enough."